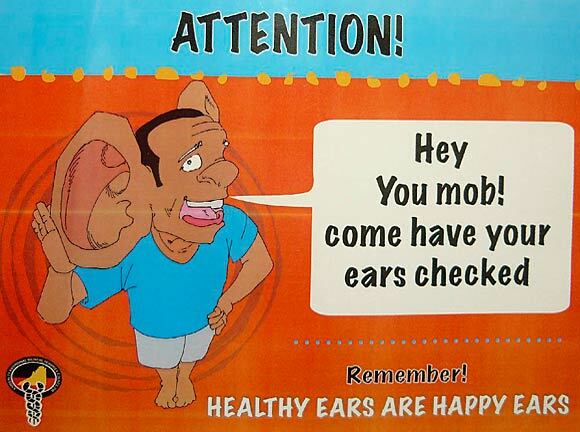 10 times more Aboriginal than non-Aboriginal people suffer from ear diseases and hearing loss, most of them children. Aboriginal ear and hearing health is in crisis. Percentage of Indigenous children aged 0-14 years with poor ear health living in remote communities in Queensland . Equivalent figure for 0-4 year-olds: 85%. In those years the auditory link with the brain develops. Times a child with hearing loss is more susceptible to sexual abuse . Percentage of Aboriginal inmates at Darwin Correctional Centre with hearing loss . Equivalent figure for male Aboriginal inmates in Alice Springs: 95% . Times Aboriginal people suffer more from ear disease and hearing loss than non-Indigenous people . Average age of first hearing aid fitting for Aboriginal children. Average time in weeks Aboriginal children and young adults aged 2 to 20 years suffer from middle ear disease. Equivalent figure for non-Indigenous children: 2 weeks . Percentage of Aboriginal children in remote communities with healthy ears. 93% of Aboriginal children suffer from middle ear infections in early childhood. In remote NT communities this ranges from 8% to 50%. The World Health Organisation regards 4% as a 'massive public health problem'. Proportion of male Aboriginal prisoners in Alice Springs prison who suffer from hearing loss. Same figure for Darwin: 92.5% . A federal inquiry into hearing health repeatedly found a relationship between hearing loss and early Aboriginal justice problems  which limits life chances of the young Aboriginal generation in education, employment and justice. With 10 times more Aboriginal people than non-Aboriginal people suffering from ear diseases and hearing loss, Aboriginal ear and hearing health is "in crisis" . A school in Meekatharra, about 760 kms north-east of Perth, Western Australia, was able to improve students' learning and behaviour when it introduced microphones and speakers in the classrooms . Teachers started to use the system in 2004 to enable all students hear instructions clearly. Amplifying the teacher's voice increased attentiveness and on-task behaviour of the students. "The students are not getting frustrated or confused about what is being asked of them. They are much happier with themselves because of their results, their confidence increases daily," observes Toni Matthews, a Year 6/7 literacy and numeracy teacher. crowded and unhealthy housing which facilitates transmission of bacteria. A "second wave" of hearing loss is caused by persistent exposure to loud noise, especially in some home environments. As family members with existing hearing loss turn up the volume of TVs, radios and phones, or simply shout and scream to communicate, other members of the family suffer from excessive noise. House parties can have noise levels similar to discos or concerts and go on for much longer. In remove communities long car trips are common, and loud music may be played for many hours – with people frequently shouting over the music to communicate. Some of the trips are used to hunt and whole family groups are passengers. But when firearms are discharged at close hearing range of small children, repeated exposure causes permanent hearing loss. In contrast, non-Aboriginal hard-of-hearing are fewer in number and mostly over 50 years old. They do not as often live with others with hearing loss, in large households, or with children. Can you believe that Aboriginal people have a greater chance of being locked up than non-Aboriginal people because they can't hear well? Ear disease, hearing impairment and communication disorders along with the life-long otitis media (OM or glue ear) affect "exceptionally high" levels of Aboriginal children . About 75-80% of all Aboriginal children have had at least one episode of Otitis Media by the age of five . Poor education leads to poorer employment and lower income, followed by lower living conditions and poorer health, thus completing a long-term cycle of a life of disadvantage. Overcrowding, poor diet, poor sanitation and passive smoking are other factors . Aboriginal students with poor hearing participate less in classroom activities. Hearing problems lead to social exclusion which progresses to relationship breakdown, alcohol and drug issues, antisocial behaviour or a criminal career. As many as 80% of students have Otitis Media and associated hearing loss at some time during any school year, 10 times more than non-Aboriginal children . Adults with hearing loss may experience more depression and cardiovascular disease . Celeste Liddle, an Arrernte Australian woman writing for the SMH and Guardian, and a National Indigenous Organiser, shares how her hearing impairment will affect her for the rest of her life . "When I was about seven years old, I was sent to speech therapy. Over a few months, I worked with a therapist to correct patterns of discussion and counteract a well-developed mumble which I had acquired. In the years that followed, many people remarked on my comparatively refined 'accent' and are usually shocked when I tell them how I acquired it. So why then, as a child, did I mumble? It was because, like many Aboriginal children, years of chronic ear disease had left me speaking how I heard the words being said to me. "Despite the fact that I will have ear problems for life and indeed am facing restorative operations and severe hearing loss later on, I am forever thankful that my issues were picked up and that I was able to access appropriate treatment as a child. This treatment allowed me to catch up to my peers at school as well as develop mechanisms to cope with my limitations. My focus on writing as a key communication mode is indeed a huge part of learning to work with these limitations. The likelihood of me eventually finishing school and going on to university would have been severely diminished had these problems not been addressed." 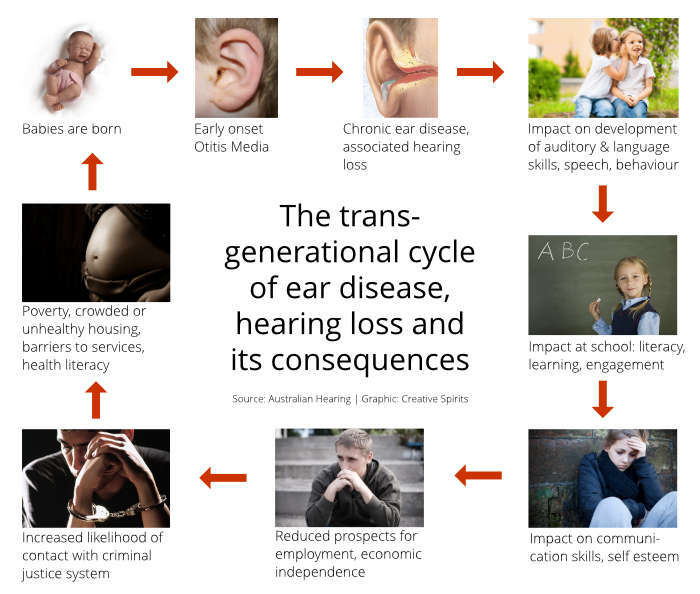 The trans-generational cycle of ear disease, hearing loss and its consequences. 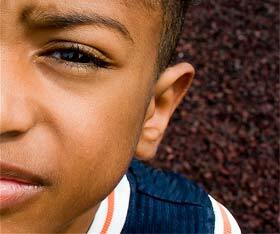 If untreated, ear disease becomes chronic and impacts language and speech development, and performance at school. Poor communication skills make id hard to find a job and easy to find a criminal career. Poor living conditions and early pregnancies ensue, perpetuating the cycle. The typical path is early onset ear disease > fluctuating hearing in early childhood > language impairment > lower school readiness > less school engagement & participation > ‘delinquency’ in adolescence > increased risk of engagement in criminal activity. Hearing-impaired Aboriginal people attending court hearings have to second-guess what is being asked or said, letting them admit things they did not do. Suspects treated as defiant or non-compliant because they didn't respond to directions might simply not have heard them. Hearing-impaired Aboriginal people are very prone to wrongful convictions. In 1961 a deaf-mute teenager was sentenced to death, but later to life imprisonment, because he made a false confession . Hearing impairment has become "a significant disability in a custodial environment" , with evidence mounting that it is also an important component of Aboriginal disadvantage.Hearing loss is often more common among Aboriginal prisoners than for their non-Aboriginal peers. Prison guards in the Northern Territory are now carrying amplification devices to deal with prisoners' hearing disabilities . Schools have started introducing surround-sound systems to amplify teachers' voices in the classroom  (see also story below). Police have a rule that disabled people must be given extra care, but abled speakers have difficulties relate to deaf and hearing-impaired people's different concepts and experience of life. Researchers demand greater translation support, such as a "hand talk" (community sign language) translator, an Auslan translator and a cultural advisor . The high prevalence of hearing loss among Aboriginal children points to it being an important factor in the high rates of abuse of Aboriginal children in Australia, says Damien Howard, psychologist in Darwin specialising in social and justice challenges faced by juveniles with a history of otitis media . No formal research has been done. A report found in 2015 that 55% of children who received services in 2013/14 suffered from hearing loss . Poor diet is one factor for declining ear health. Many Aboriginal families, especially in remote communities, only shop for food once a fortnight or occasionally. They choose food they can keep in the freezer which excludes fresh fruits or vegetables. When doctors supplied families with subsidised vegetables they watched students' hearing return, to the point that a formerly introduced amplification system could be abandoned, antibiotics cut down, and infections decline . "It is very simple and was cheaper than buying antibiotics," said one doctor. "Antibiotics cost $100 for a bottle but 100 [dollars] buys you a lot of fruit." The only hurdle to delivering more such programs is funding. For others, the hearing damage is permanent. They need hearing aids. 75% said they did not feel shame when wearing their hearing aids. Damien Howard has put together the Look After Kids' Ears website which has lots of resources about middle ear disease (sick ears or otitis media) and listening problems (hearing loss). It helps educators, teachers and families learn how to prevent kids from getting hearing problems. The Queensland government is running the Deadly Ears Program for children. It aims to reduce the high rates of conductive hearing loss in Aboriginal communities and achieve long-term changes across the education, health and early years services.